Cancer: A modern scourge or the cost of being a multi-cell organism? Although I knew intellectually that cancer was not a new disease since it had been described in early medical texts, I always thought that it was more a scourge of recent times. The tweets, the news reports, the innumerable stories of new cancer treatments promoted on the web, the ongoing recommendations for specific foods, vitamin supplements, and lifestyle recommendations to prevent cancer, and the heart wrenching stories of celebrities telling their personal cancer saga, all suggested that cancer rates are increasing and definitely a modern disease. It is difficult to make sense out of this maelstrom of pessimistic and optimist news about the war on cancer. Yet, if one can take a broader perspective, cancer is not the number one killer–that honor belongs to heart disease. And, although breast cancer is terrifying, many more women die of heart disease than breast cancer (Jemal, et al, 2008). Most likely, cancer has been with us since we evolved from a single cell—it may express the fundamental life force of a cell when it becomes threatened or is no longer subservient and supportive for the maintenance of its community of cells. It is humbling to realize that cancer transcends our human history. It has even been found in dinosaur bones. If it was in the bones, then other cancers probably also occurred in the dinosaur’s soft tissue. It is equally humbling to recognize that although environmental and dietary factors can affect carcinogenesis, in most cases the data is much less clear. So often one study finds a beneficial effect and then a few years later another study reports the opposite finding. Yes, some behaviors are generally harmful-smoking increases the risk of lung cancer significantly although most smokers do not die of lung cancer. And, most likely the major significant factor in the recent decrease in breast cancer death rate is that women are smoking less and stopped using hormone replacement therapy. One thing is clear, cancer is part of our human biology and it has occurred since multi-cellular organisms (e.g., morula) evolved to deal with cellular stress (Boaz, 2002). 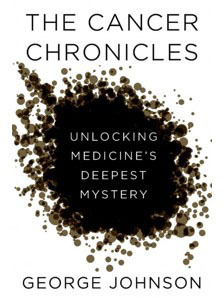 To grasp the biological complexity, the confusion that exists and appreciate how to perceive different perspectives, I strong recommend reading the remarkable book, The Cancer Chronicles: Unlocking Medicine’s Deepest Mystery, by the award winning science writer George Johnson. (Johnson, 2013). Boaz, N.T. (2002). Evolving Health: The origins of illness and how the modern world is making us sick. New York: John Wiley & Sons. Make your voice heard! Contact your legislators how they should vote on possible Syrian Intervention. Optimum health implies living a healthy life style and being an active participant in the community. In the next week, the US will make a decision whether or not to initiate some form of military action in Syria. Whatever the US will or will not do may have significant long term unexpected consequences. Enhance your community health by participating in shaping your legislators’ decision making process. By actively participating and encouraging others to participate, we increase our social connectedness. In taking action, we become empowered and reduce helplessness which improves immune function. The Syrian conflict is tragic and the use of chemical weapons horrible; however, how the USA and other countries can resolve this horror is not as clear. President Obama has stated that he wants to initiate some form of military action (most likely a cruise missile attack) to show that the use weapons of mass destruction is unacceptable. What is not clear are the consequence of such military intervention. Personally, I am strongly opposed to military intervention especially when the endgame is not clear. On the other hand, I strongly support giving add to the millions of refugees. Congress will decide around September 9th whether to support or not support President Obama’s call for military action (an act of war). Congress’ outcome will be influenced by the views expressed by the public. Be an active participant and let your voice be heard whether you are for or against military action. Make your voice heard! Contact the President, Vice-President, your two Senators and your Representative. This decision should not be left to a few people in power. Remember NOT participating is still participating. Below are the email contacts for the President, Vice President, California Senators and the websites to find your senators or representative.